Back cover blurb: Dan Leno, the great music hall comedian, was known in his lifetime as 'the funniest man on earth'. 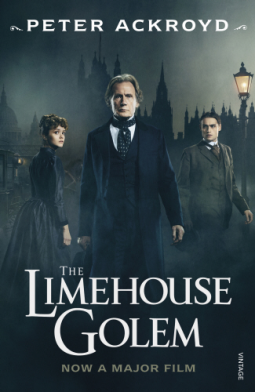 So how could he have been involved in one of the most curious episodes in London's history when, in a short period during the autumn of 1880, a series of murders was attributed to the mysterious 'Limehouse Golem'? In Peter Ackroyd's novel the world of late-Victorian music hall and pantomime becomes implicated in a number of sinister scenes and episodes, and the connection between the light and dark sides of nineteenth-century London begins to attract contemporary figures as George Gissing and Karl Marx. But there are also less well-known characters who play a significant role in the narrative. What, for example, is the secret of Elizabeth Cree, about to hang for the murder of her husband? The Limehouse Golem is my favourite kind of novel, historical fiction with a murderous theme! London, the early 1880's and Elizabeth Cree is about to hang for the murder of her husband, John Cree. We are quickly introduced to Mrs Cree and her spectacular fall from grace from one of London's brightest theatre/music hall stars, to convicted murder. But there isn't only one murder in question here. London has been terrified of late by a ripper-esque figure known only as the 'Limehouse Golem'. Brutal murders and dismemberment are the Golem's thing and Detectives are pulling their hair out looking for their perpetrator. Elizabeth Cree's story is interlinked cleverly with the diaries of her murdered husband, John Cree and they provide a fascinating insight into their lives together and what they do whilst they are apart. But can they be trusted, and is all as it seems? The Limehouse Golem is a dark murderous novel with gothic undertones. It has recently been made into a film, and actually for once, I am quite excited to see how Hollywood have treated this brilliant book! The Limehouse Golem is available now via Amazon online and all good book shops.